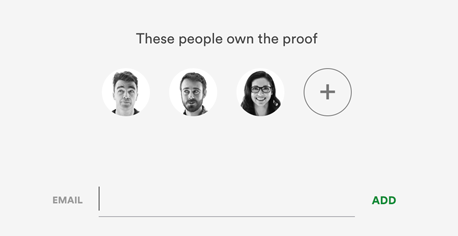 As an owner on the proof, you can add or remove another proof owner. A proof owner has full management of the proof (managing the workflow, delete, archive, adding other users etc). Adding and removing proof owners is done in the proof’s info pane. In the owners section, click the plus icon. Then enter their email address and click add. In the owners section, hover over the owner’s avatar and select remove.